Just add water for instant decadence! The luxuriously deep flavor of Ghirardelli Hot Cocoa Premium Indulgence creates the intense, lingering chocolate experience cherished by true cocoa lovers. We start with cocoa from the finest beans, blend just the right amount of sugar and real vanilla, and add real chocolate for a rich chocolate taste. 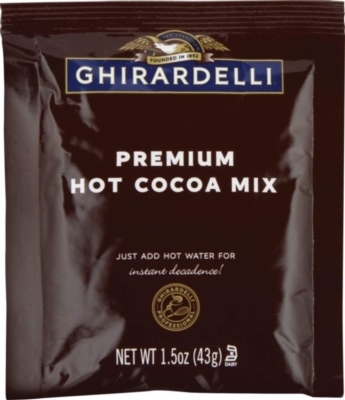 Ghirardelli Premium Indulgence Hot Cocoa Powder is specially formulated to dissolve with ease in hot water. Simply stir and enjoy. Buy 90 Packets of Double Chocolate and save even more. For great tasting hot cocoa, pour one packet of cocoa into a mug. Add 8oz of hot water, stir, & enjoy!